The Blue Moonstone is an enchanting gemstone with a very high ‘coolness’ quotient, if one could put it that way. It is an elegant gemstone with a very calm yet powerful aura, something of a great self-assuredness about it. Gemstoneuniverse presents to you the new lot of Indian blue moonstone Vipraa 2012, aptly named so because of the ‘Brahminical’ pristine purity it embodies. Blue Moonstone is a gem belonging to the Orthoclase Feldspar group. It is nearly transparent, sometimes translucent with a distinct Blue schiller or adularia. Blue moonstone is a phenomenal gem that displays adularescence -there is a distinct blue schiller or adularia visible when light falls on this Blue moonstone. This shimmer called schiller is caused by interaction of light with tiny crystals of albite within the gem. 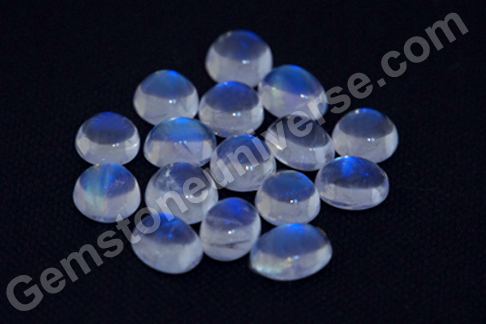 Blue moonstone is a gem that is always fashioned as a cabochon to allow maximum display of adularescence. The healing properties of the Blue moonstone were well known and appreciated by the ancients. Blue Moonstone is replete with the powerful energies of the Moon as well as the divine feminine. Not surprisingly, Moon represents the mother element in the zodiac. It was believed to heighten the psychic powers of the wearer. It is known as the Chandrakant Mani in Hindi. While the Romans called this gem Astrion, it also goes by the name of Selenite. It is popular as the birthstone for June in the West. Blue moonstone is the substitute gem of Natural Pearl. Set in a talisman, duly consecrated and energised, this gem is used to harness lunar energies for stable as well as better quality of life. Blue moonstone is easily distinguished from the imitations as the latter will always be milky in appearance and the schiller / adularia is not mobile. In an authentic blue moonstone, the schiller moves with the movement of light source. 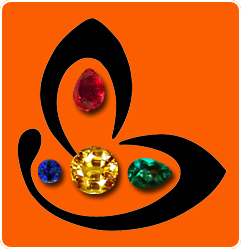 Note: Certification and appraisal process of all the gems in these two lots is complete and they will most certainly be made available for online purchase within the next couple of weeks.